Two days ago I attended the first workshop, focused on how to lead a team, of my NPQML course. Amongst other things we were reminded of Bruce Tuckman’s team-development model (Forming Storming Performing Normning) and did some role play *cringe* of difficult conversations (if any of my NPQML buddies are reading this, see the following blog posts for advice on having difficult conversations: @TeacherToolkit’s here; @ICTEvangelist’s here or @katie_s_ashford here). After lunch we were asked to get into groups of three with people we hadn’t yet had a chance to talk to throughout the day. Whilst one would be observing, the other two team members were tasked with the job of building a tower using newspaper and masking tape. The tower had to be as tall as possible and needed to support a Freddo. I understand that this is not an uncommon task to set groups on team-building days but it wasn’t something I’ve done before and, being competitive and enjoying a challenge, I was pretty excited to get stuck in as a builder. We were told that we would have 10 minutes to complete the challenge. Before the time started, Tom (my fellow builder) asked me if I wanted to construct something resembling the Eiffel Tower or St Paul’s Cathedral. Thinking he was joking I suggested, instead, that we aim for the Taj Mahal. At this point he seemed to think through how that could be achieved with the materials at hand and I quietly bemoaned my proposal. The countdown started and I initially attempted to agree a plan with Tom. It became apparent, however, that Tom had already settled on creating a tripod-like homage to the Eiffel Tower. I was still debating how were going to be able to support a Freddo on top of one of those, and wondered what scrunching paper up might achieve, when he started rolling sheets of newspaper. Tom suggested I got on with scrunching to see what came out of it. As a natural strategist I’d have preferred to talk things through first but, buoyed by his action, I got stuck in. With Tom rolling and me scrunching it was clear that, if we were going to be successful, we could not continue on these divergent paths. It would be like trying to make a tasty cocktail by combining milk with beer (I’m pretty sure this wouldn’t work). My scrunching efforts were clearly not meeting the requirements of height, I think I had a croquembouche vision but not enough time to scrunch sufficient paper profiteroles, so I decided to defer to Tom’s plan. 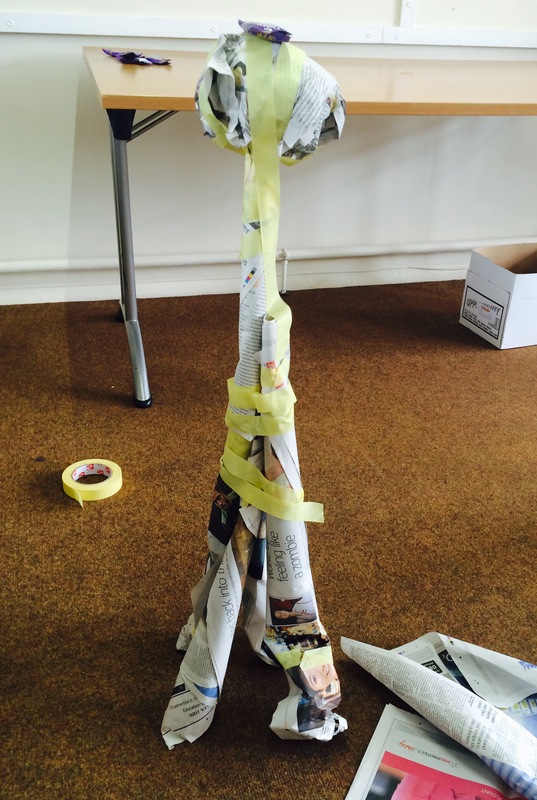 Sadly we didn’t win but we did create something that was both tall(ish) and supported a Freddo. Hurrah. The first thing I learnt from this activity was the power of the plenary. It was through the debrief of the activity, with skilful questioning from the facilitators, that I understood the range of things I could take away from such a seemingly simple activity. I could have dismissed it as a bit of nonsense but the fact that I’m still thinking about it two days later is largely down to the reflection I was led through. I learnt that it is important to have a clear vision and a plan of how to achieve it. Yes we did meet the goal but if the towers in the room were in a league table ours would be sitting somewhere in the middle. We all know what lies in store for coasting schools… Neither of us had a vision of a spike topped with a ball but that’s what we ended up achieving. Even if I didn’t agree with Tom’s Eiffel Tower vision, or he my croquembouche, it would have been better to commit to one or the other from the start. I think this highlights the power of planning backwards – thinking first about what you want to achieve (and what that looks like), sharing this clearly with your team and then working together to achieve it. I learnt that you need to agree on the ‘how’ as well as the ‘where’. Tom and I were both working towards the same goal, something tall and supportive, but we had different ideas about how to achieve it (roll vs. scrunch). We didn’t achieve the best results because we didn’t have an agreed strategy and therefore there was every chance that the first few minutes’ worth of my scrunching would all have been for naught. We shouldn’t be in the business of wasting, or allowing people to waste their own, time. If you have a shared strategy this can be avoided and you won’t have team members wasting their efforts on things that will eventually be discarded. ‘You can only spend time once; spend it wisely’ (@LeadingLearner). I learnt that it is worth looking around you. Had I done this sooner I would have seen a very sturdy, and tall, tower being built by rolling whole newspapers up before stacking them one on top of the other. Being the magpie that I am I would have seen that team’s success and stolen their shiny idea. Why not? In the teaching world it seems very sensible to me to see what successful teams are doing, or what research is telling us works, and cherry pick the ideas that will work in our own contexts. I learnt that to achieve a goal you have to be able to deal with curve balls. Some teams didn’t get to the resources table quick enough and therefore either didn’t get their hands on enough paper or didn’t have masking tape. They had two choices: give up and sit eating their Freddo or try to achieve the goal despite the challenges they faced. These teams managed by borrowing from others and making the most of the resources they had. We’re a resilient and adaptable bunch, us teachers, and we need to be able to work with what we’ve got and what gets thrown at us. Whether that’s a change in the curriculum, a team member on long term sick or a lack of resources, a successful team will find a way to work through it. Finally, I learnt that CPD is what you make it. I could have enjoyed the activity, eaten my Freddo and moved on. If you see CPD as a day off teaching with the possibility of a decent lunch you’re missing a trick. If, instead, you take the time to reflect on your learning you might just come away having learnt something useful. Next Entry Is it brave to teach teenagers?